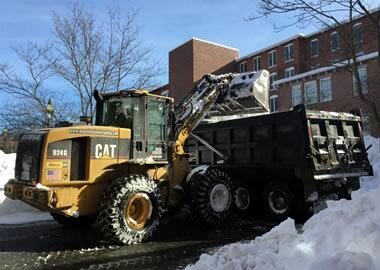 Mueskes Landscape and Snow Management owns and operates a large fleet of equipment for effective snow removal or snow relocation regardless of the size of the storm. For commercial snow removal, snow relocation and snow trucking, Mueskes Landscape and Snow Management owns and operates a large fleet of front-end loaders, Bobcat skid and track steers and dump trucks. Snow storage can become challenging during a long winter and we know how to manage it. We can removed your snow off site, relocate it on site, and provide clearing of snow off roofs and awnings. We are available 24/7 on an emergency basis to keep your site open to customers and employees. Don’t let your business shut down because of snow. At Mueskes Landscape and Snow Management, we can perform commercial snow management services overnight and on the weekends to minimize any disruption in your daily operations.